So, this is a family pie recipe, and it just happened to be my great grandma Lola's favorite pie! 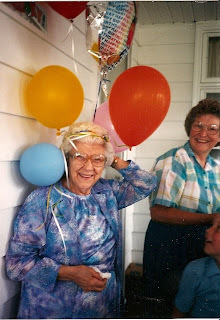 Grandma Great, as we all called her, passed away last August about three weeks before her 104th birthday. She was an absolutely amazing woman, and I feel so blessed that I got to spend so many years with her! 4. Add berries. 5. Stir well. 6. Add cream, and mix well. 7. Rub some flour into the bottom of the pie crust. 8. Pour berry & cream mixture into waiting pie crust. 9. Bake in 400F oven for about 10 minutes. Then, turn it down to 350F, and bake for an additional 35-40 minutes, or until center is set and crust is golden. I love this pie's name. It makes me want to sing... "Her name was Lola, she was a showgirl, with yellow feathers in her hair and her dress cut down to there..." Makes me miss her too, but I'm glad we have her favorite pie recipe to pass down the generations!